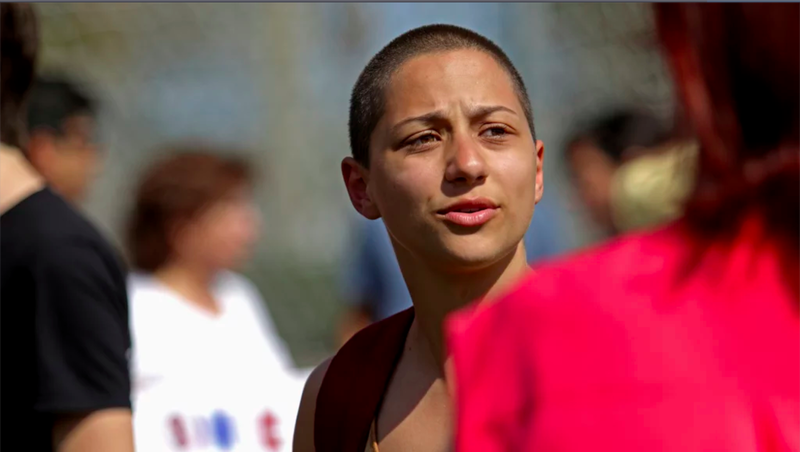 Like the rest of the country, I’ve been following Emma Gonzalez and the other Parkland, FL high school kids. These teenagers, though still staggering around in stupefying grief after losing their friends to gun violence, mobilized #neveragain, a substantive movement targeting the NRA. Their audacity is pure and uncynical. These kids mean business. For the first time in too many months, I feel a palpable sense of hope for our future. This movement has galvanized us here in the States as well as around the globe in just a few short weeks, a mind-boggling pace. Some of the swiftness of the movement makes perfect sense. These teens are internet-savvy, having marinated in social technology platforms since they were teething. They are uniquely poised, as the most recent victims of a mass shooting, to speak to the disaster that is our nation’s gun policy situation. But beyond all of the conditions that teed up this moment in history, the most powerful tool these teens have in their quiver is their unfiltered, righteous outrage. They’ve been watching from the wings and have seen the anemic, nonsensical ways adults dealt with the unspeakable tragedies at Sandy Hook, The Pulse, Las Vegas, and the countless other public acts of violence at the hands of easy-access weapons and the most ruthless and expensive legislative lobbying operation in the world. And they’re TEENAGERS. But of course they are. Teens don’t know a lot about limits or boundaries, so they perform exhaustive tests and inquiries. This is how kids learn, how they locate themselves in larger systems (like families and schools and friendships). Parents often find themselves unwittingly involved in these experiments and worry that their child has strayed from the values of the family. They don’t recognize this testy Other, this exotic and irritable creature. A parent typically responds to these tests based on messages from their own upbringing; defenses slide into place, tensions mount. Still, this push-pull is vital to growing up: it’s the main ingredient of individuation, the process of forming a stable personality. And it’s what brings many parents of teenagers into my psychotherapy office. I hear their fear and frustration about their children. I see the tears and the struggle to comprehend. Who is this kid? Why are they acting like this? We’ve done everything for them… how can they treat us this way? Parents feel helpless and embarrassed that they don’t have control over their teen. They fret about the amount of time their kid is hidden away in her bedroom (not to mention all of the science experiments taking place in old cocoa mugs under the bed). They miss seeing their kid, miss being included on details. They worry that their child is lost. But the whole point of this experiment is to impose distance between parent and child, a way for the kid to discover what is meaningful to her – despite what her parents think. Teens fight for this right to discovery. They get snarly and pissed and don’t respect boundaries. This is human passion compressed into an awkward, budding frame. It’s magical and beautiful and deserves to be heard and celebrated. We herald the passionate voices of the #neveragain movement – the voices of teenagers who are in deep shock and confusion. To them, we can look to find evidence of the strength and talent in all of our kids.